Tom Beard (69), retired from working on small car blocks in No. 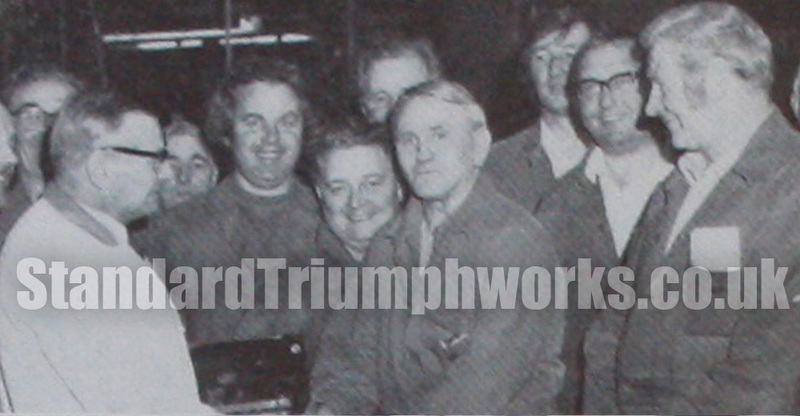 5 Shop, Canley, after 20 years’ service at Standard Triumph. Tom had always been a machine operator and worked for many years at Banner Lane before moving to Canley. A large crowd saw him receive a sum of money from Nos. 3, 4, and 5 Machine Shops, presented by Bob Brown, chargehand, and an electric toaster from gang 71 presented by Richard Mattocks, foreman 3, 4, and 5 Machine Shops. Tom and his wife intend to remain at 19 Fir Grove, Tile Hill, among their friends. They have a son who is married, and there are two grand-children.